Julie Pullman, Jan’s daughter (and my granddaughter, of course) has had to come up with some creative storage ideas. Julie Pullman lives with husband Mike and 17-month-old toddler, Evie in a small duplex, which they own. Storage space is extremely limited. Until they got their new bed, they stored food under that. Now they store food wherever they can find or make space. 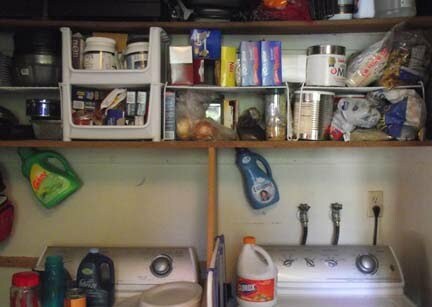 This is actually some of the shelves in their linen closet in the bathroom (right). Mike built shelves over their washer and dryer, which sits behind louvered doors in their small kitchen. 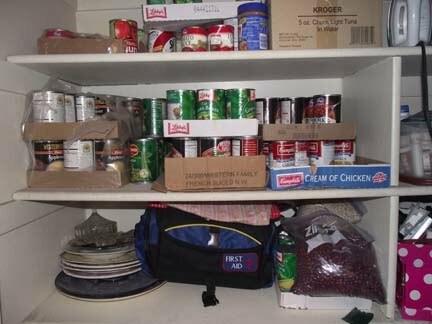 It works for food and other miscellaneous storage. Share your creative storage ideas with us, by email or a comment to this post. This entry was posted on Wednesday, July 21st, 2010 at 10:54 pm and is filed under Storage Ideas. You can follow any responses to this entry through the RSS 2.0 feed. You can skip to the end and leave a response. Pinging is currently not allowed. NEXT: Want a Root Cellar?